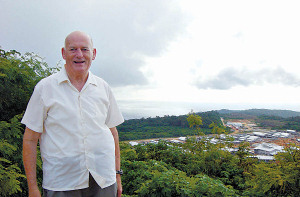 Monsignor John J. Murphy, former Director of the Australian Catholic Migrant and Refugee Office concluded his journey here on earth, Monday, November 14, 2011. The Australian Catholic Migrant and Refugee Office joins the many people who mourn and offer prayers for this truly good and faithful servant of Jesus Christ and of the Church. During his life, Monsignor Murphy has served the Church in various ministries. The Australian Catholic Migrant and Refugee Office wishes to remember him, above all, for his long, passionate and generous contribution to the ministry to migrants and refugees. In 1969, he was appointed Director of the Catholic Immigration Office of the Archdiocese of Melbourne, where he served until 1992. After few years as Dean of St Patrick’s Parish in Mentone, VIC, the Australian Catholic Bishops Conference appointed him National Director of the Australian Catholic Migrant and Refugee Office (ACMRO) on July 1 1995, where he served until the end of 2008. In my role now as Director of the ACMRO, I see continually the profound care and commitment that permeated Mons. Murphy’s ministry to migrants and refugees. In January 1994, he was awarded the Order of Australia Medal (OAM) for his service to the Catholic Immigration Office. Together with the ACMRO Staff, I take this opportunity to thank Monsignor Murphy for his faith-filled contribution to the pastoral care of migrants and refugees in Australia, and his assistance to dioceses, religious institutions and others in this work, over many years. His death happened during the last week of the liturgical year which concludes with the proclamation of Chapter 25 of Matthew’s Gospel: “Come you, whom my Father has blessed, take for your heritage the Kingdom prepared for you since the foundation of the world. […]. For I was a stranger and you made me welcomed”. (Mt 25:35). I have no doubt, the Lord has welcomed Monsignor Murphy home now with the same care and consolation he welcomed so many migrants and refugees in Australia. I’m sorry to hear of Mgr John Murphy’s death. I still remember him when I was stationed in Melbourne as a curate at St Luke’s Parish (1996-199). He was really a man of God who championed the ideals of being called to serve. I pray for the repose of his soul. Requiescat in pace. Amen.